“We still have hope,” Abdullaziz told me on our on-again off-again phone call from his refugee camp home close to the Darfur border (where they do not have great cell reception!). “But all refugees agree that Scott Gration should resign,” the school director at Obama School said in a clear and determined voice. Darfuris in the US, inside of Darfur, and living as refugees have been united in their opposition to Special Envoy to Sudan Scott Gration’s approach in dealing with the genocidal government in Khartoum. They know the consequences of trusting al-Bashir, the indicted war criminal: their villages are burned, their men killed, and their women raped. There is now new US policy on Sudan, and Gration is the point man in implementing this policy. We must stand in solidarity with the citizens in danger in Darfur and all of Sudan. The measure of progress must be knowing that not one more village is burnt and the rapes and killings stop. 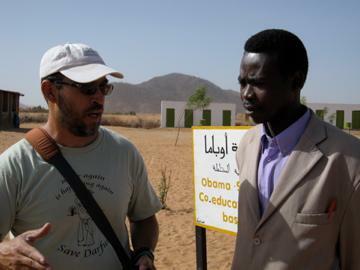 Peace, protection, and justice is what Abdullaziz has mentioned every time we talk about going back home to Darfur. “As Gration speaks as he speaks about trusting al-Bashir, the government has recently bombed and burnt four villages with many Darfuris dying,” Abdullaziz told me. Please help Abdullaziz’ message reach President Obama.